Michael Singer’s sculptures are part of public collections in the United States and abroad, including the Australian National Gallery, Canberra; Louisiana Museum of Modern Art, Humlebaek, Denmark; Guggenheim Museum, New York; The Museum of Modern Art, New York, and the Metropolitan Museum of Art, New York. Singer has participated in a number of the most important exhibitions of the past thirty years including the Guggenheim’s “Ten Young Artists Theodoron Award Exhibition,” “Documenta 6,” The Kunsthaus Zurich’s “Mythos and Ritual,” “Sculpture in the Twentieth Century” in Reihen, Switzerland, The Walker Art Center’s “Sculpture Inside Outside,” and The Museum of Modern Art, New York City “Primitivism in the 20th Century.” He has had several one-person shows, most notably at the Guggenheim Museum, New York City and most recently in 2011-2012 at the Utzon Center in Aalborg and the Danish Architectural Center in Copenhagen, Denmark. Below is a selection of Michael Singer’s indoor sculptures from 1970-1987. First Gate Ritual Series 10/78. 1978, wood, stone, phragmites. 108 x 156 x 180”. Collection of the Museum of Modern Art, New York City. Cloud Hands Ritual Series. 1985, wood, granite, fieldstones. 68 x 160 x144”. Solomon R. Guggenheim Museum International Sculpture Exhibition, 1985, Courtesy of Sperone Westwater, Inc, New York City. Ritual Series 80/81. 1980-1981, wood, fieldstones. 58 x 207 x 217”. Collection of the Solomon R. Guggenheim Museum, New York. First Gate Ritual Series. 1982, granite, slate, fieldstones. 30 x 144 x 72”. Collection of the Hirschorn Museum of Art, Washington D.C., gift of Vera List. Cloud Hands Ritual Series 80/81. 1980-81, pine, ash and stone. 57 x 171.5 x 201”. Collection of the Louisiana Museum of Modern Art, Humlebæk, Denmark. Limit Balance III. 1971, steal I beams, 336 x 180 x 36” (left) Unit Balance I. 1971, wood. 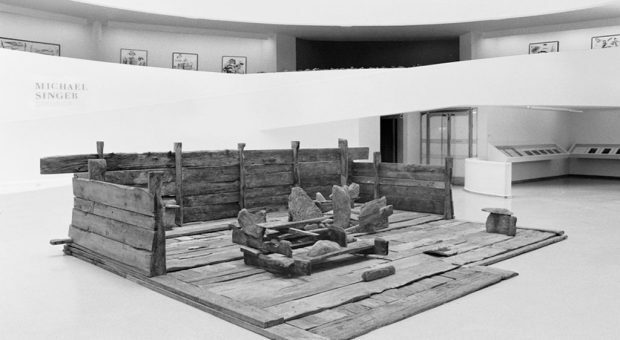 48 x 108 x 60” (right) Installation View, Ten Young Artists: Theodoron Awards, Solomon R. Guggenheim Museum, New York, 1971. Cloud Hands Ritual Series 83. 1983, granite, fieldstones. 26 x 105 x 64”.